Simone de Beauvoir witnessed Hitler‟s Nazis systematically murdering six million European Jews, as an unremarked second genocide excluded Woman in the Western cultural imaginary. Ever prescient she divined this eruption of masculine madness not as something exceptional but as the surface condition of masculinity, of ordinary men capable of unordinary acts. For centuries endemic patriarchy subjugated and oppressed women, but ordinary men argue that the exclusion and oppression of women, and particularly the violence inflicted on women, is not their fault: that nature or biology, reason or rationality, a beast stirring beneath their consciousness, makes them do it. 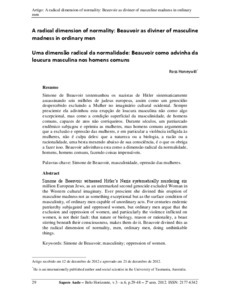 Beauvoir divined this as the radical dimension of normality, men, ordinary men, doing unthinkable things. Simone de Beauvoir; masculinity; oppression of women.